Do you want to win an Oscar like Rami Malek? Do you dream of making an acceptance speech like Olivia Coleman? This could be the first step on your journey. On accepting her Oscar for the role of Queen Anne in The Favourite, Olivia Coleman spoke about her time as a cleaner (she loved that job!) and used to dream of making that speech. Could this be YOU? Are you Kent’s next big thing? This is your chance to shine, working with Kent’s only professional open air touring Theatre Company. This summer we are looking for TWO young people, between the ages 17-22 to perform with our company of actors in this years summer tour of William Shakespeare’s The Winter Tale, and Jessica Swale’s Nell Gwynn. The company is keen to seek out a local guy and girl to appear in one of each of the shows. Does this appeal, or do you know a budding actor? Get in touch! Are you considering a career in theatre? Or are you doing your A-Levels and want to go to drama school? This experience will be invaluable. The knowledge of a professional theatre company will put you in a position head and shoulders above other auditionee’s or university applicants, You will be able to learn from the best, taught and mentored by Director Rob Forknall, and fellow actors. The camaraderie within the company will give you the encouragement to achieve your best, and delight audiences across Kent with top class theatre. The Apprentice Scheme has produced many great success stories. Last years apprentice, Hannah May from Kings Hill played key roles in our open-air tour of Shakespeare’s Measure for Measure. She recently told us how “being the apprentice for Changeling taught me incredible amounts about Shakespeare and classical text. But it also gave me an insight of what exactly is expected of an actor in a professional touring environment. The experience and skills that I gained in those few months have been invaluable towards my current auditions. I am presently in the process of auditioning for drama schools and studying with RADA’s Young Company which I am immensely enjoying”.We are delighted that Hannah is en route to her dream of becoming a professional actor. The support and skills that the Changeling cast and Director gave her during the weeks of rehearsals and performances undoubtedly developed her acting abilities. YOU could be this years Hannah! The successful apprentices must be available to perform throughout the tour and be prepared to travel to rehearsals in London and to various venues across the South East. In return for their time, the apprentice will be offered on-the-job training and mentoring, and a young person’s railcard to assist with travel costs. Rehearsals start on 27thMay in London, the tour starts on 28thJune and finishes on 18thAugust. If you know someone who fits the bill, they should email Changeling Theatre with a photo and some details including their age, where they live, any acting experience and whether they play a musical instrument. They would also like a brief reason as to why the applicant would like to audition. Deadline to apply is Monday 8th April: hello@changeling-theatre.com. 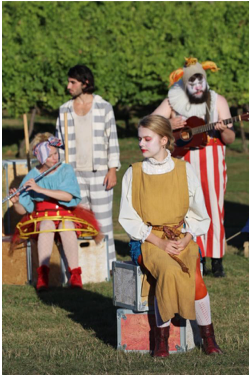 The Changeling will be performing Nell Gwynn here at Biddenden Vineyards on Sunday 4th August 2019, more information including how to buy tickets may be found here.